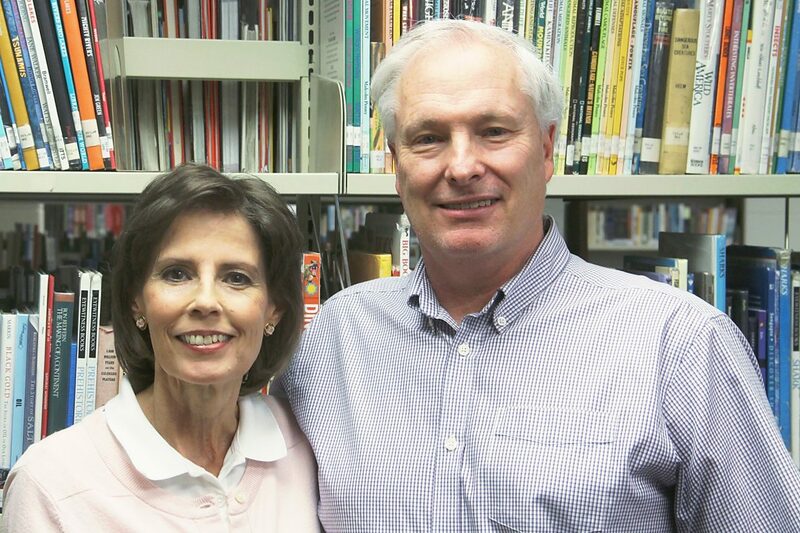 Becky, a 19-year district employee and her husband Brad Thayer, Glenwood Springs Middle School assistant principal wrap up their time with Roaring Fork School District. Two fixtures of the Glenwood Springs schools system plan to hang up their hats at the end of the school year, as do several other long-serving area educators. After 25 years with the district, Glenwood Springs Middle School Assistant Principal Brad Thayer plans to move to the Front Range with his wife, Becky, herself a 19-year district employee. Longtime business teacher and DECA coach Bryan Whiting, known affectionately as Dubs, wraps up 33 years with the district. Roaring Fork School District’s 10 retirees represent more than 200 years of dedication, while Garfield RE-2 and Garfield 16’s departures represent almost as much again. Thayer, 57, knew from an early age that he wanted to be involved in education. “I’ve never thought about doing anything else,” he said. As a teen in Aurora, he got jobs coaching and worked with the handicapped. He got his degree from the University of Northern Colorado. In 1980, he landed a position as a special education teacher and assistant football coach at Glenwood Springs High School and moved to the valley with his new wife. Nine years later, he decided to try general education at Glenwood Springs Elementary, where he later became assistant principal. He spent his summers in Greeley, working on additional degrees. When Glenwood Springs Middle School opened its doors in 1991, Thayer joined the team as a 6th grade math and science teacher. Soon, Becky Thayer joined the GSMS team as a library aid, allowing both of them to spend their summers with the rest of the “B family”: Brooke, now 29, Blake, 27, and Brianna, 25. Becky later moved up to librarian, and after more than a decade as a teacher, Brad decided to tackle administration again. He served as a full time assistant principal until the school hired a new dean of students, shifting Thayer’s focus to teacher facilitation. Each class was different, he observed, and both the students and the educational landscape have changed a lot. In his time on the Western Slope, Thayer took up fly fishing, rafting, camping and mountain biking, and he grew to love the town. Still, with both parents and kids on the Front Range and a grandchild on the way, he’s confident in his decision. Whiting, 67, started out in business before he became interested in teaching, and ended up doing both. He grew up in Wyoming, the son of a one-room school teacher and a motel owner turned superintendent. “I was working the desk at the motel when I needed a stool to stand on to see over the counter,” he said. After finishing up his business degree, he started student teaching in Casper. When the teacher got appendicitis, he ended up taking over for months at a time. He later moved to Brush, where he met his wife, Kathy, and set up a business class based on the Distributive Education Clubs of America (DECA). They pair occasionally visited Glenwood on skiing trips and got engaged at the Hot Springs Pool. After six years in Brush, he was asked to start a DECA program at Glenwood Springs High School, and they made the move. The first year, 14 students participated, and for a while he taught other subjects — calculus, history, literature — and coached football, basketball, baseball and golf. Today, 140 students are enrolled in DECA, and about half of them opt to take both years. Whiting attributes some of that to a nationwide shift from a manufacturing and agriculture economy toward business. Soon, Glenwood became a powerhouse in the regional DECA competition, in which students are assigned a business scenario and given 15 minutes to prepare and 15 minutes to follow through or solve the problem through role play. He led the school to organize the first DECA invitational in the country, giving area schools a chance to practice their skills instead of heading straight to districts, state and nationals. The town flocked around him, and each year dozens of local business people volunteer as judges. “I couldn’t have done any of this without the community support, and of course the kids have been essential to the program,” Whiting said. He has enjoyed being on the same schedule as his wife and their three children: Amanda, 28, Eric, 26, and Jason, 24. While Kathy Whiting plans to stay on as principal of Sopris Elementary School, Bryan thinks the time is right for him to bow out. The ultimate fate of the DECA program will depend on whether the school can find a suitable replacement. Meanwhile, Whiting plans to spend more time managing the family farm and is contemplating writing a book on macroteaching. Whiting is a strong believer in different learning style and works hard to teach equally to those who learn by reading, listening, doing or watching. He’ll miss working directly with students. In the end, Whiting identifies as a teacher first and foremost. Thayer and Whiting are just two of 20 teachers leaving schools from Parachute to Basalt. Lisa Whitmore departs this year after 27 years with RE-2 and 36 in education. She spent 20 years as a special education teacher and another five as a special education administrator before she took the helm at Cactus Valley Elementary 11 years ago. She plans to stay in the area with her husband, perhaps playing more golf and enjoying the outdoors. “As one of my elementary students said, ‘you’re going live your life,’” she chuckled. Doug Bristol came to the valley in 1982 to enroll in Colorado Mountain College’s photography program. He spent some time as a self-described ski bum before he got his teaching degree and started 5th grade at Carbondale Middle School. After 10 years, he transferred to Basalt High to teach technology, where he’s been for the past 15 years. “There’s nothing like walking into a school in the morning and feeling the energy start to rise as the school fills with kids, any age,” he said.